The Legatum Fortune Technology Prize will encourage business to tackle poverty through technology. At Brainstorm Tech, the discussion ranged from Apple to the next XO laptop, and from changing tech standards to changing the world. NEW YORK (Fortune) -- Fortune this week announced the Legatum Fortune Technology Prize, an annual $1 million award intended to reward for-profit efforts to provide products and services to the poor through the use of technology. The announcement of the prize was for me the high point of an amazing three days at our Brainstorm Tech conference in Half Moon Bay, Calif., where many of the world's top techies gathered to network, exchange insights, and engage in some spirited debate. We launched the Brainstorm conference series in Aspen in 2001, and this year we made its longtime tech connection explicit. The 300 or so attendees included activists like Larry Lessig and Esther Dyson, investors like Index Ventures' Danny Rimer and Venrock's David Siminoff, as well as the CEOs of Amazon (AMZN, Fortune 500), Applied Materials (AMAT, Fortune 500), Fon, Google (GOOG, Fortune 500), Intuit, Joost, MySpace, RealNetworks, Salesforce.com, Sybase, Verizon (VZ, Fortune 500), and Viacom, just to name a few. I was conference director. Brainstorm is all about finding the connections between how the world is changing, where technology is going and what that all means for business. So a prize that ties those themes together makes a lot of sense. This prize will address what's perhaps the world's top problem: the disparity in wealth between a thin layer of rich people in a few countries and the masses in so many places who live lives of deprivation and exclusion. There's no question that tech is a key tool to raising living standards for the poor, and that while philanthropic efforts are important, business has a unique role to play. The Legatum Group, which is funding the prize, agrees. For-profit business efforts both large and small will inevitably be the most sustainable, powerful and rapid means by which to bring greater wealth to the world's poor, particularly in the developing world where such an approach has often failed to gain traction. Such businesses run the gamut from innovative giant cellphone or broadband systems that go into previously-unconnected countries to local startups that bring innovation to a tiny village. Perhaps a new way to use SMS messages to help farmers, or a service that improves the efficiency of monitoring and granting micro-credit loans. Surely the best examples will be things yet to be thought of. We will consider awarding the prize to any kind of effort we deem revolutionary and deserving of great attention, and our judges have the discretion to divide the prize among entrants. The chairman of our judging panel is Iqbal Quadir, founder of Grameen Telecom, perhaps the world's most renowned success in tech for the poor. Grameen is one of the largest cellphone providers in South Asia, and best known for coming up with a unique model to empower local women in Bangladesh. It helps them offer cellphone service to others in their village on a per-call basis. Quadir is now at MIT running The Legatum Center for Development and Entrepreneurship, funded with a $50 million long-term investment by the Legatum Group. You've likely never heard of Legatum. It is an enormously successful investment company controlled by Christopher Chandler. You will be reading more about Chandler in coming months. The institution of this prize and the center at MIT (created last year) mark the beginning of his emergence from a deliberate strategy of anonymity. 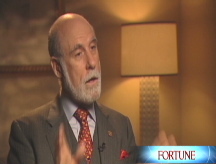 He is one of the world's great contrarian investors, worth many billions. Legatum recently revealed that in India alone it currently controls $4 billion worth of investments. Chandler is a New Zealander who with his brother Richard began investing globally in 1986, using the proceeds from the sale of a small chain of department stores started by their parents. They created a group called Sovereign Global. It bet big on commercial real estate at the time of the transition in Hong Kong from British to Chinese control, when most of the world was profoundly pessimistic about the city's prospects. Using the proceeds of those investments, the brothers went into Eastern European oil and gas infrastructure around the time of the transition from Communism. And so on and so on. These guys are willing to take risk. Sovereign was disbanded in 2006, the brothers struck out alone and now Christopher Chandler's Legatum operates both a huge fund and a growing philanthropic arm. It has also set up the Legatum Institute "to promote the principles that drive the creation of global prosperity and the expansion of human liberty." You'll be hearing more about the prize in coming months. Meanwhile, there were plenty of other amazing things at Brainstorm. 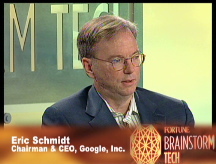 Eric Schmidt reiterated that he thinks Google's purpose remains largely to change the world for the better. 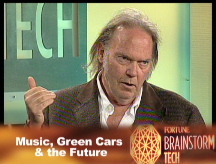 Rocker Neil Young told of how he is using his celebrity to bring attention to two major issues - the degradation of music, as he sees it, from an art form into a convenience with MP3 and iTunes, and the need to get the world off of oil. He's a pioneer of energy-efficient vehicles. Nicholas Negroponte of One Laptop Per Child explained that the next phase of his philanthropic project for the world's poor children will explicitly encourage others to copy the innovative two-screen laptop device his group is now designing. For all the conference details go here. One session was devoted to exploring the connections between technology and peace. Among other things, we asked whether it's possible that new social technologies could begin to instill greater compassion in users. That would be an advance worthy of quite a prize.